Half of Chicagoans believe the city is “on the wrong track,” according to a new poll of registered voters, which also indicates that Lori Lightfoot will win the charge of getting the city on the right track as Chicago’s next mayor. Lightfoot leads Toni Preckwinkle by a whopping margin of 53 percent to 17 percent, according to the results of a WTTW/Crain’s Temkin/Harris poll, released Monday. But with another 29 percent still undecided in the runoff race for mayor, Preckwinkle stands to gain ground enough that Lightfoot won’t necessarily cruise to a 36-point victory. Poll: See the full results. The poll by Melissa Harris and Max Temkin, conducted by Normington, Petts & Associates from March 18-20 in partnership with WTTW News and Crain’s Chicago Business, surveyed by phone (including cellphones) 500 Chicagoans likely to vote in the upcoming mayoral election. The poll has an overall margin of error of plus or minus 4 percentage points. Lightfoot leads in every subset of voters, but she’s particularly popular with those who are white and college educated, 62 percent of whom say they’ll vote for her versus 11 percent solidly behind Preckwinkle. White voters support Lightfoot 64 to 13, while black voters support her 41 to 21. The poll also sheds light on Mayor Rahm Emanuel, and his seemingly sudden announcement in September that he wouldn’t seek a third term. 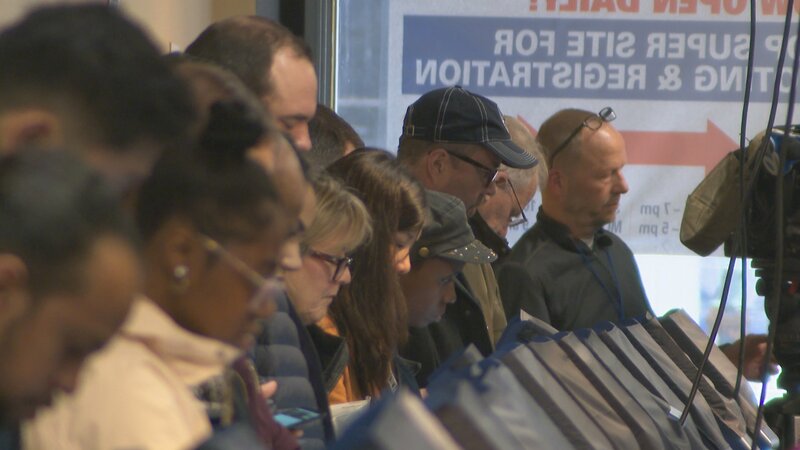 That news lead to a total of 14 candidates vying for his seat in the Feb. 26 election, with Lightfoot and Preckwinkle, in that order, receiving the most votes – but fewer than 50 percent – thus advancing to a runoff. Only a quarter of those surveyed said they would vote for Emanuel if he were running this year; 63 percent said they would not vote for him. Only 12 percent were undecided. Voters ages 70 and up were more inclined to give Emanuel another shot: 27 percent said they’d re-elect him, versus only 3 percent of voters aged 40-44 and 5 percent of voters between the ages of 18 and 29. And support for Emanuel waned across party lines, with roughly 60 percent of those who classify themselves as Democrats, independents and Republicans each saying “no” to voting for him again. Likewise, blacks and whites were equally unsupportive of the mayor, with roughly 60 percent saying “no” to Emanuel, compared with 73 percent of Hispanics. No matter who wins on April 2, the historic election will give Chicago its first African-American woman to serve as mayor. She will have to confront a deepening budget shortfall, and planning for a pension tab that’s expected to escalate by $1 billion annually by 2023. Neither candidate has expressly said how she’ll come up with the money. But the poll indicates a willingness by a majority of city residents to dig into their pockets to help Chicago scrape out of that fiscal mess, albeit to varying degrees depending on what the tax hike would pay for. Seventy-one percent of those surveyed say they’d strongly or somewhat agree to pay higher taxes to fund infrastructure repairs; 69 percent agree to pay higher taxes if the money funds either quality mental health services or better schools. Support drops to 60 percent if higher taxes would pay for additional police patrolling Chicago neighborhoods. Support is most lackluster for higher taxes that would fund retirement plans for municipal workers and Chicago Public Schools teachers: 57 percent of those polled agree that they’d personally be willing to pay higher taxes to pensions; only 31 percent of those strongly agree – about equal to the 29 percent who strongly disagree with the prospect. That’s not to say that voters aren’t paying attention. The WTTW/Crain’s Temkin/Harris poll (see the raw data here) asked likely voters how closely they’re paying attention to five topics that consistently make local headlines. Chicago’s “public pension crisis” came in at the top, with 65 percent of voters saying they follow the issue, 35 percent of those following pensions “very” closely. Fifty-nine percent of likely voters are keeping an eye on the federal investigation into Ald. Ed Burke, who faces a criminal charge of attempted extortion, with 28 percent of those following the case closely. • Sterling Bay’s massive Lincoln Yards development that would turn the former Finkl Steel site into a modern city-within-the-city. • A new police training academy slated to be built in West Garfield Park, despite opposition from activists who want the money instead spent on disenfranchised communities. Why is Lightfoot’s campaign surging? The poll doesn’t lead to a clear answer, particularly given that there is no clear correlation between the issues a voter is closely watching and his or her preferred candidate. “The prominence of the issue fails to predict support for a mayoral candidate,” Normington said. Video: Meet Max Temkin and Melissa Harris, the co-creators of the Temkin/Harris poll. Back to top.